Two of the most entertaining teams in the Indian Super League go head to head in the first leg of the second semi-final on the 12th of December . Atletico de Kolkata finished second in the Indian Super League points table with 23 points from 14 games and were the first team to secure qualification for the playoffs while Chennaiyin FC finished third with 22 points fro 14 games and were the last team to secure qualification for the play-offs. Atletico de Kolkata started off the season strongly with wins over Chennaiyin FC and Kerala Blasters in their first couple of games. The defending champions then suffered three back-to-back defeats against FC Pune City, NorthEast United, and Delhi Dynamos, but strong individual performances from Iain Hume and Sameehg Doutie put them back on track with big wins in their next four matches. On the other hand, Chennaiyin FC started off the season poorly with two consecutive defeats against Atletico de Kolkata and Delhi Dynamos, but then registered three wins in their next four games. Just when we thought they’d easily make it to the semi-finals, they failed to win their next four games, and were in danger of failing to qualify for the playoffs. However, Stiven Medoza’s brilliant performances upfront and a solid defence helped them win their last four games in the group stages to secure a berth in the semi-finals. Coming into their semi-final, both teams are in great form and are very similar in terms of player performances in a few areas on the field. Atletico have won 4 of their last 6 matches while the team from Chennai come on the back of 4 wins on the trot. 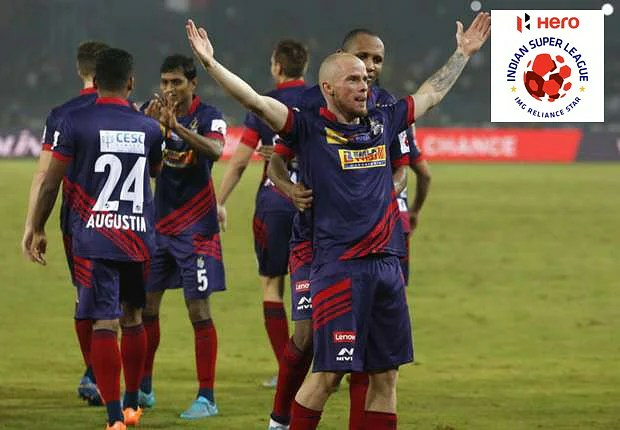 The Kolkata outfit looked like a very defensive team last season but that changed with the arrival of Iain Hume, Sameehg Doutie, and Arata Izumi. The defending champions scored 26 goals in the group stages and conceded 17 goals. The stats are a bit similar for Chennaiyin too as they have so far scored 25 goals and conceded 15 goals. Both Atletico de Kolkata and Chennaiyin FC registered the least number of draws during the group stages, with the former drawing two matches while the latter drew just once. 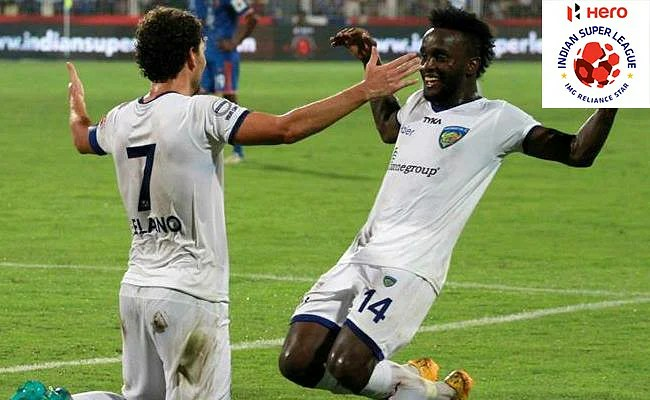 John Stiven Mendoza has been the star for Chennaiyin FC, scoring 11 goals. These goals have pushed the team to success and were a major reason why Materazzi’s men made the final four. Jeje has also chipped in with 5 goals for the Chennai outfit, and has helped Mendoza ably. Elano and Bruno Pelissari have been their main creative forces and are the danger men who will make all the difference with their passing in midfield. Thoi Singh’s running and Khabra’s control will also be important for Chennaiyin, especially in the injury-enforced absence of Raphael Augusto, who had performed very well in the group stages. In defence, Wadoo and Mendy have been constants and have worked well together with Mailson and Dhanachandra. Atletico are a team that has moved on from being a predominantly defensive outfit last season to one that plays free-flowing football this year. Iain Hume has been the best player for Atletico de Kolkata, and has scored 10 goals and provided 4 assists as well. The attacking midfielders Arata Izumi and Doutie have worked very well with their intelligent running and smart linkup play. Borja has been solid in midfield while Tiri and Arnab have held the defence firm. In Edel Bete and Amrinder, both teams have goalkeepers who have been very important to their run so far, and both will look to continue their great form. Atletico de Kolkata won both their games against Chennaiyin FC during the group stages but that would count for nothing as the Indian Super League is very unpredictable and it’s difficult to predict a clear winner over the course of two legs. The team from Kolkata won 2-1 at home in their latest enounter while they outplayed Chennaiyin and won 3-2 in the opening match of the second season of the Indian Super League. Looking at that, the advantage seems to rest with Atletico de Kolkata. The fact that Chennaiyin FC will be playing their home match at Pune because of the incessant rainfall and flooding in Chennai could prove to be pivotal. With their enthusiastic and passionate home support not available to cheer them on, the Marco Materazzi managed outfit could find it tough to lift themselves up sufficiently for the first leg. Considering that the second leg is in Kolkata, one would have to favour Atletico as they have always played well in front of their home support. All factors considered, if we were to pick one team then we’d go for Atletico de Kolkata on aggregate over both legs as they have always managed to win games under pressure, and have the champions mentality in them. They look more organised, and in Antonio Habas they have a better tactician to get the best out of players.